If you are interested in arranging a closed class in your area, please contact me via email – contact@brianmullinsphotography.com – to discuss. The shooting boot camp class is designed for the beginner or intermediate photographer who is already familiar with the technical controls on their camera and are looking to truly take better photos. 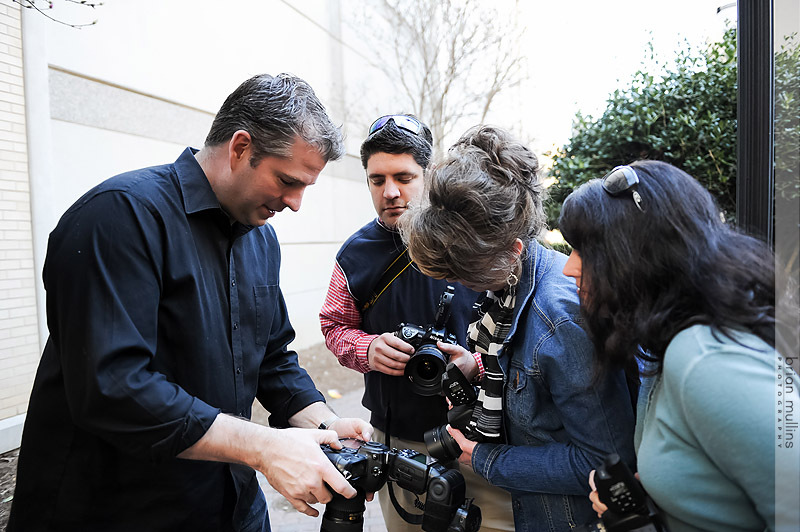 If you are not comfortable shooting in manual mode on your camera, we highly recommend taking our Photography Bootcamp class at our Apex, NC studio. Given the nature of this class, only a cursory review will be given for shooting in manual mode and other technical questions. Taking your photography to the next level is the infinite pursuit of every photographer. Whether you shoot weddings or portraits, working in the field is the ultimate challenge and tests your mental and technical abilities to the fullest. In the shooting bootcamp, we’ll be going in-depth into how to use the light, your surroundings and gear to create a unique one of a kind image. To accomplish this, we will examine the strategies to find good natural light, how to make your own light when needed, work with your clients to get the best out of them and combine it all to create great photos in a quick and efficient manner. After taking this class, you will have a new found confidence in handling any lighting or location scenario, be able to quickly create great images and further creating your own unique style and approach. Getting your “field” mentality in order. Framing and composing your shots to create mood. Creating diversity in your work quickly. How to travel light, fast and effectively. I’ll bring off camera flashes with modifier(s) and triggers to connect to your camera. Brian Mullins is an award winning photographer based in Apex, NC. His work primarily consists of wedding, portraits and commercial (including architectural & food) photography. He has been a professional photographer since 2005 and has a background in both cinematography and theater/stage lighting. Brian started his career as a magazine photographer and was published numerous times prior to his wedding work. After only eight months shooting articles for Cary Magazine, he was promoted to Chief of Photography – a position previously held by his mentor. Since then he has won multiple awards for his wedding photography – most notable is his Indy “Best of the Triangle” award in 2014. Brian’s wedding and portrait work is notable for both his invisible and visible use of light and lighting. His work at night has garnered wide attention for both it’s subtlety and drama in an environment not typically known for photography.